Sumatran tiger Asim will first have to woo the zoo’s resident female Melati but, conservationists say, he has the pedigree and personality to create a new dynasty of one of the rarest creatures on the planet. With as few as 400 Sumatran tigers left in the wild, every cub born keeps the iconic feline one pace away from extinction. 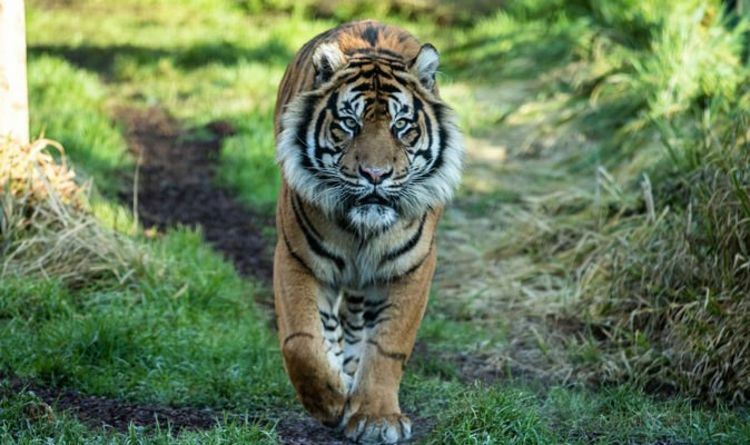 ZSL London Zoo today announced Asim’s arrival along with the hopes that he will play a successful role in the European Endangered Species Programme (EEP) for Sumatran tigers. As seven year old Asim – his name means Protector in Arabic – arrived from Denmark’s Ree Park Safari in a bespoke travelling crate with climate control, London Zoo’s previous male Jae Jae was heading across the English Channel to Le Parc des Félins, with the same objectives of starting a new family. Jae Jae and Melati's twin cubs born in June 2016 have become star attractions at the zoo and, if Asim fits the bill, there could be more patter of tiny tiger cub paws in coming months. Already signs are looking good after only a few hours on British soil. ZSL London Zoo’s head tiger keeper Kathryn Sanders explained: “Asim is a handsome, confident cat who is known for being very affectionate with the ladies in his life. We’re hoping he’ll be the perfect mate for our beautiful Melati. “In the wild, the male always approaches the female’s habitat when looking for a mate. "At the moment Asim and Melati can see and smell each other from their separate paddocks. It’s important to let Asim get to know his new surroundings before we formally introduce them. “It’s early days but we’ve already seen some good signs. There has been lots of ‘chuffing’ which is a happy sound they make to let each other know they have good intentions. Zoo staff flew out to Denmark last year to see Asim and get an insight into his personality after he was matched by the EEP programme. His big loves are chicken and playing with empty boxes sprayed with herbs and spices. As Asim was patrolling his new beat, global tiger experts have been meeting in New Delhi to hear stark warnings about efforts to help the iconic big cats recover in the wild. The tiger range states have agreed to tackle the critical management gaps across the big cats’ domain which stretches over 13 separate nations, spanning India, Russia and Indonesia. Efforts to double tiger numbers by 2022 are being hampered with warnings that a third of conservation sites risk losing their tigers because many lack basic management plans. Most are in South East Asia, with up to 60 per cent of the sites facing issues over anti-poaching efforts. Stocktaking figures warn that recent assessments in Myanmar show no breeding animals, although less than 10 per cent of potential tiger territory has been surveyed. Malaysia has witnessed a “significant drop” from earlier estimates of around 250-340 animals. Rebecca May, Asian programme manager at WWF, added: “These new figures show a mixed snapshot of wild tiger populations across South East Asia. In Myanmar where breeding is clearly taking place, this gives us hope, although their numbers are worryingly low.